First, i would like to highlight Woodys article which gives some insight as to what may have happened to 93. I want to say there is so much info on flight 93 that its hard to include it in this page, so i urge you to read all of the links. I will start with some oddities, then move on to the maps further down the page. How many people were scheduled to fly on flight 93? Frank at the-movement.com has identified several here... Flight 93 Weirdness Since then we have added several to this list that either were scheduled at the last minuite, or were put on flight 93 cos flight 91 was cancelled. The funny thing about this is that flight 91 was a LATER flight, not an earlier one! We have been hard pressed to find anyone who bought a ticket for this flight before sept10th. Next, we have 2 seperate incidnts of planes being reported at the same time at 2 DIFFERENT ariports on Sept 10th. 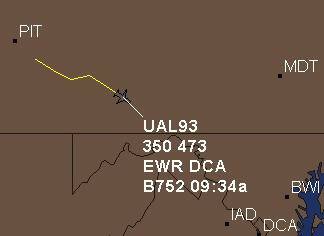 First is 591UA (to be flight 93), next is 594UA. In Arpil of 2003 the person below, supposedly flew 591UA (from his logs). My imidiate reaction was that he wrote down the number wrong, but on second look, i noticed that he also wrote down the NOSE number which also identifies the plane. It is very doubtfull that he waited till he got home then looked up the nose# on the internet and cross-referenced it. Noticing the other flights, it seems he wrote down the NOSE#'s on all planes seperately. These numbers can change with the planes. Checking the BTS.GOV records, the plane was flight 1111 and the tail number was 594UA. More oddities have been recognised by researcher Frank Levi. 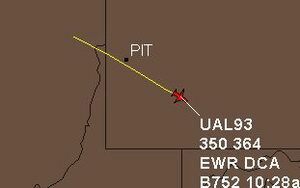 The estimated arrival times of "Flight 93" (aka N591UA) starting at 2:15 PM, then it changes SOUTH of Pittsburgh, well after it was hijacked and a new flight plan was filed to 10:28. Also another close researcher pointed out to me, that all flights were being diverted by the time 93 was officially hijacked. And yet the transcripts give the impression that it was still on its way to San Francisco at the time. According to some hobby plane spotters, N591UA was still flying in 2003.Some researchers also indicated that this original UA-flight is "masked" as N594UA.There is a website, which shows 23 Boeing 757s, which were ordered, but never built.What happened with them? An investigation into the production of the Tail Numbers (N591UA has construction #28142) also revealed, that "State Street Bank & Trust Co" is the trustee for the plane owners for 590 592 593. So it it makes one suspect that N591UA could have been in that sequence, too. 594 arrived in Chicago from DTW at 10:58 as 1581 It arrived before it left. This is not possible. 591UA did the same thing. It was seen at 2 different airports at the same time on Sept 10th. This info is usually supplied by ACARS automatically. Then the arilines send it to the BTS.GOV database. It is unclear to me if a UA employee could manipulate this data before it gets to the database or not. This raises SERIOUS questions. From what i understand this is not a normal occurance, and for 2 planes with links to 911 being invloved, it seems the odds are astronomical. confusion in the skies? Delta 1989? Here is the full sequence for flight 93 given to us by flight explorer. 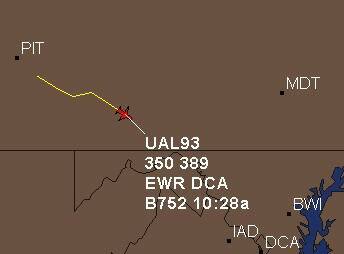 The map here shows the last point as being 10:28am(ETA) with a destination of DCA. at 364 mph. This is a map I created showing the flight explorer points I saw as relavent. 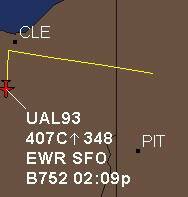 Notice when it is approaching Pittsburg, it is still showing SFO as the destination airport. The flight explorer maps show it was at 9:35 it made the turn. The Newark-to-San Francisco flight reportedly diverted its route near Pittsburgh and ignored calls from Pittsburgh International Airport controllers. Allegheny County Emergency Management Coordinator Bob Full said that Pittsburgh International Airport officials had knowledge of the plane headed for Pittsburgh and that it was taking precautionary action when the plane diverted its course. The plane actually reached the Cleveland area before turning around. ABC News reported that a request to change the flight plan to Washington, D.C. was asked for by someone on the plane. the ETA, BUT it crashed much later than that. As you can see here the map shows that the destination airport changes well south of Pitt. (as does the ETA). So did Flight 93 file the new flight plan after it was hijacked? Supossedly the hijackers were in control of the craft at this point. Here you can see flight 93 at 36,900ft travelling at 435mph ! kinda fast to make a 90 degree turn eh !!! It slows to 348mph, but increases in altitude ! At 40,700ft, this is about the time many of the cell calls were supposedly have been made. As a cell phone engineer, i find this quite hard to believe! These top to maps show the last 2 recorded "blips" from the flight explorer maps. The speeds are different, and the ETA is also different ! I thought they may be at 2 differnt point, so i did an overlay of the images. This is the ACTUAL last blip as recorded in flight explorer this shows an ETA of 9:34 ! Its noted that the plane crashed much later than that! its also shown as traveling at 473mph and at 35,000ft. this is at odds with witness reports that the flight had slowed down and was low in the air. Flight 175 and 93 crossed paths ! We also have the probem of WHY 3 airports were evacuated? Cleveland, Johnstown and Pitt were evactuated because of either Delta 1989 OR flight 93. I have to wonder why a airport would evacuate a tower just because it lost radio contact? It is not like these towers were targets as the WTC or Pentagon were? The plane may have been in trouble an needed an emergency landing, so why make everyone leave? Other reports have indicated that the ATC guys controlling Johnstown airport were told to leave and a "new guy" from Cleveland was coming in to handle the situation? Many 9/11 researchers pray it all over again: "There were lots of warnings." What's up with AMERICAN airlines flight 93? Flight93 scenario, by WoodyBox (November 2004)The *real* UA 93 pushed back from the gate at 8:01. 9:16 A "hijacking exercise" begins (the pilots have been informed previously about a drill, so they take part on the game). 9:25 The plane lands in Johnstown. The airport has been evacuated before - apart from a "core team". were coming from flight 93, indeed (even the cellphone calls!) but the plane was on the ground. Harrisburg: Some members of the german "Phantom"-forum on ezboard speculate about Harrisburg Airport, as another possible switch for a UA93 stand-in. "...A short time later, Cleveland called again. The unknown aircraft was now fifteen miles south of the field, heading directly for Johnstown. The tower should be evacuated. Fritz ordered four workers to leave. Still, he saw no sign of a plane through his binoculars. Forty-five seconds later, the Cleveland center called a third time. Disregard the evacuation. The aircraft had turned south. Cleveland had lost radar contact." "Logicon Task Team", part of Northrop Grumman This "task" included Veridian (in 2003 aquired by General Dynamics), Advent Systems Inc., Mountain View, EDS, Advanced Engineering & Sciences, RDR Inc., SRS Technologies. In March 2001, Logicon TASC officially announced their five-year, $57 million contract for "Trailblazer" (WP reported. Another subcontractor of Logicon TASK (diff. sp.) became Modern Technologies Corporation (MTC) of Dayton. MTC included Kenneth A. Minihan (ex-NSA, ex-DIA) and General Lawrence A. Skantze (ex -U.S. Air Force). Most obvious, some of the real perpetrators of 9/11 are also hiding at SAIC. Controlled by at least two former CIA bosses John Deutch and Robert Gates, SAIC is meanwhile connected with one anthrax suspect, the "maintenance" of e-voting machines, former OEM-Director Jerome Hauer, some other drills, the audition of Venezuela's oil company PDVSA, plus equity partners like Bechtel, Danet, Saudi SAI, DigiLens or VeriSign. According to New York Times tax correspondent David Cay Johnston, Peter R. Kellogg is also using the "Indian tribe" scheme to avoid paying taxes. Tax-exempt entities from Indian tribes to pension plans to Dutch banks with offices in the West Indies regularly "rent out" their tax-exempt status to tax cheats, for a relatively small fee and at virtually no risk to themselves. Though sharing the same name, Peter Kellogg seems to be not related to Halliburton's KBR. It also became most obvious, that the official timeline of targets messed up on that morning. Following all diverted flight routes, it makes not much sense anymore, why the alleged "hijacker" attacked their targets in that particular order. It's possible, that the order of targets was mixed up. DaveMc Gowan has more on a possible scenario, in which in made more sense, for the "Pentagon to be the first target struck". Apparently the real perpetrators of the 9/11 drill screwed up or had been in competition with another script. As "letsroll"-member Herb Briggs explained, the original Amalgam Virgo document on GlobalSecurity, was possibly altered, to distract from the 513th Air Control Group (AWACs) deployed from Tinker AFB. According to GlobalSecurity, this group "was activated at Tinker Air Force Base, OK, on March 15, 1996". I will explain their significane further below. In August 2004, Briggs checked the Tinker website, but there was no mention of the 513th. Briggs is right. In late November 2004, there are still no recent documents about 513th Air Control, in their search engine. There is however an important detail about Tinker, which obviously had some prior knowledge about a pending attack. On April 30, 2001, an Air Force alert was issued from Tinker Air Force Base in Oklahoma City concerning "possible intelligence collection being conducted by Israeli Art Students." Tinker AFB houses AWACS surveillance craft and Stealth bombers. Between June 1-4, on Tyndall Air Force Base, Fla., members of the 513th Air Control Group, tested new "fast, low-flying cruise missiles", which are hard to detect. Was this a test for the Pentagon wing, which was later attacked on Sep11th? Lt. Col. Lee of Oklahoma City worked as a pilot for United Airlines. He was on call in Denver on Sept. 11, 2001, waiting to fill in if another pilot was sick or could not make a flight for any reason. West Virginia flight control notices a new eastbound plane entering their radar with no radio contact and no transponder identification. They are not sure if it is American Airlines Flight 77. 9/11 researcher Woodybox wonders, who is "West Virginia flight control"? There is no long-range Air Traffic Control Center in West Virginia, so he has his doubts if this "eastbound plane" emerging at 9:05 really existed. West Virginia University’s Department of Mechanical and Aerospace Engineering. Michael Kane: "9/11 War Games - No Coincidence"
What does the FAA have to hide? "Flight 11 - The Twin Flight"
Security at Dulles AGAIN - AND- flight 91 and flight 93 ! "Twin tails" of pre-Flight 93 and other "phantom flights"
The official timeline of Sep11th is breaking apart. On Sept 10th 2001 a plane with the tail# N591UA was reported in 2 different places at the same time accoring to a Government database at http://www.bts.gov/ this plane was reported the next day to have crashed as flight 93. More here and also in the article above. John Doe compiled quick new summaries about Flight 93: Too many contradictions and Identifications of hijackers by DNA. "...On September 8, 2001, the LEPC together with the Buffalo-Niagara International Airport ran a full-scale terrorist exercise. More than 350 participants were involved in the exercise that simulated an aircraft landing with a terrorist on board and the threat of an explosive device on the plane. The exercise was a tremendous success..."
9/11 was a combination of older terror drills, NOT wargames! Major parts had been also tested during Amalgam Virgo 01 (June 2001) and during three until recently lesser-known drills in Westmore County, Buffalo and Dayton. These three drills had odd similarities with the fate of Flight 77, Flight 11, Flight 175 and Flight 93. According to Dulce Decorum, who researched repair records, he found out, "that N519UA was a heap of junk, always breaking down and needing repair, while 591 was a healthy plane"
(Reminder: According to some plane spot-witnesses, Boeing 757-222 SERIAL NUMBER 28142 is flying around Chicago under the alias 594UA. What Really Happened to Flight 93? White said the plane had been moved to a secure area of the airport, and was evacuated. United identified the plane as Flight 93. The airline did not say how many people were aboard the flight. United said it was also "deeply concerned" about another flight, Flight 175, a Boeing 767, which was bound from Boston to Los Angeles. On behalf of the airline CEO James Goodwin said: "The thoughts of everyone at United are with the passengers and crew of these flights. Our prayers are also with everyone on the ground who may have been involved. "United is working with all the relevant authorities, including the FBI, to obtain further information on these flights," he said. This story has been removed from WCPO.com. It was a preliminary AP story, and was factually incorrect. No one can yet say exactly how close the hijacked jetliner that crashed Tuesday in Somerset County came to Pittsburgh, but a map of the flight path shows the plane passing just south of the city. The Federal Aviation Administration said yesterday it turned over to the FBI a radar record of United Airlines Flight 93's route. The data traced the Boeing 757-200 from its takeoff from Newark, N.J., to its violent end at 10:06 a.m., just outside Shanksville, about 80 miles southeast of Pittsburgh. FBI agents refused to comment about the flight path. During the two hours Flight 93 was aloft, it traveled westward to Cleveland, then made a sharp turn to the south, according to a map provided by Flight Explorer, a Virginia company that sells real-time flight data it receives from the FAA. 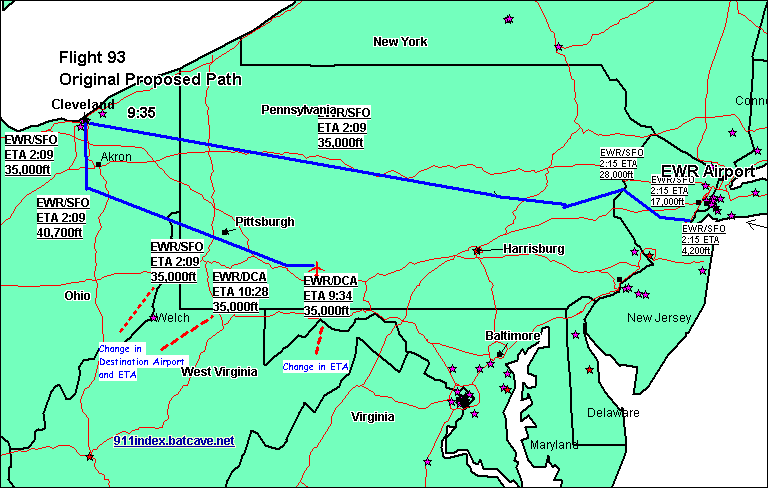 Flight Explorer's map shows that after the jetliner turned south, it banked back eastward, cutting through West Virginia's Northern Panhandle before re-entering Pennsylvania. As the plane neared Somerset County, air traffic controllers in Cleveland alerted their counterparts at John P. Murtha Johnstown-Cambria County Airport that a plane was about 12 miles away, "heading directly at the airport at about 6,000 feet," said Joe McKelvey, the airport's executive director. "The Johnstown tower chief told me that under the circumstances, he was going to evacuate the tower," McKelvey said. "Before either one of us could get off the phone, the aircraft had already passed us by." Moments later, it crashed 14 miles to the southeast, killing all 45 people aboard.